Cohort is very happy to announce two dynamic new members among its pool of artists and ensembles: The Third Guy and Down The Rabbit Hole ! The Third Guy is a duo based in Brussels, Belgium, featuring Primož Sukič on guitar and Ruben Orio on percussion. 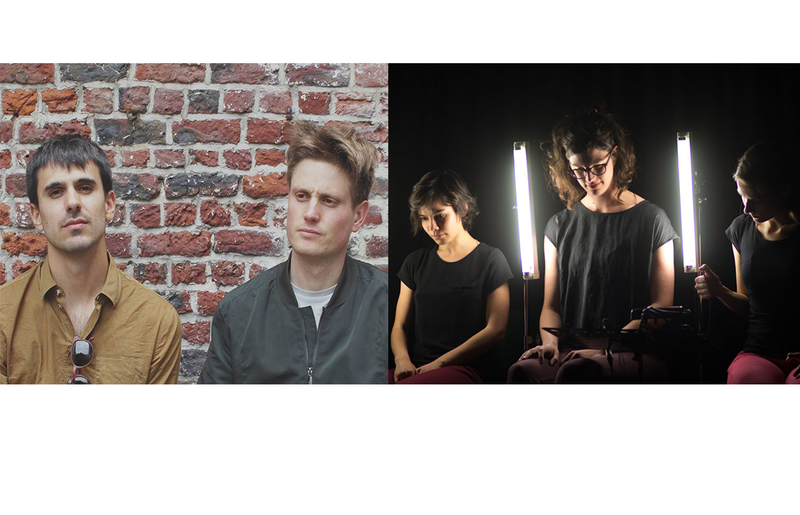 Although the two musicians have already been playing together since 2014, when they first met at the post master-academy program offered by the ICTUS ensemble and the HoGent Conservatory, their official debut dates back to January 2017, which was a result of an artistic residency at QO-2; a concert venue based in Brussels, focusing on experimental and contemporary music. Their musical, and artistic researchs based on composing works that explore, and blur boundaries between improvisation, programmed computer algorithms, and composition. The ensemble also focuses on collaborating with other musicians (composers, interpreters, improvisers), and artists from other artistic fields, among whom each of them bring in new personalities and aesthetics, that, for every performance, reshape, and sometimes even redefine the identity of the ensemble. Since the beginning of their first concert in 2017 The Third Guy has premiered more that seven new works all together, composed by composers such as James Saunders, Marko Ciciliani, Caroline Profanter, Matej Bonin, Elina Lukijanova, and Mihael Maierhof. Their performances have taken place in SIRGA Festival (Flix, Catalunia), University of Southampton (UK), Champ d’action in Antwerp, SPOR Festival in Aarhus (Denmark), Ljubljana city museum (Slovenia), Miry concert Hall Ghent, iMAL Brussels. Down the Rabbit Hole is a music collective founded in summer 2017 and co-directed by clarinetist Filipa Botelho (Portugal), percussionist Kaja Farszky (Croatia) and cellist Hanna Kölbel (Germany). Hailing from throughout Europe, we are committed to the emerging scenes within contemporary music, identifying with the art of nerdy entertainment and thus pushing borders by building new dramaturgies for sound creations. Identified as performers of contemporary music we naturally search for extended techniques: we are wild curators of our concert programmation and indulge into setting up a superb performance space. As a music collective, we love to challenge and support fascinating creative artists to follow their ideas. To make this juicy newness happen we play acoustic instrument, voice, touch, light… all to spark the senses of our young, old, big and small audiences.